If you are looking for somewhere just a little different to enjoy a couple of cocktails then Bar Stories on Haji Lane might just be the place for you. We discovered it quite by chance thanks to a magazine article my husband was reading on the plane back to Singapore from one of his many work trips. Bar Stories is in one of the beautiful shophouses along Haji Lane, the entrance is unassuming and easily missed, just a door taking you to a flight of stairs. Once you get upstairs you enter a small bar area and beyond that are some intimate seating areas. We booked in advance as it was a Saturday night and given the size and popularity of the place I'd recommend you do the same if you fancy making it part of your weekend. Our seats had been reserved at the bar, we didn't ask to be there but it was a perfect place to sit as this is not quite your average cocktail bar and there are no drinks menus. Instead of menus the mixologist will make you a cocktail based on your personal likes and tailored to you. 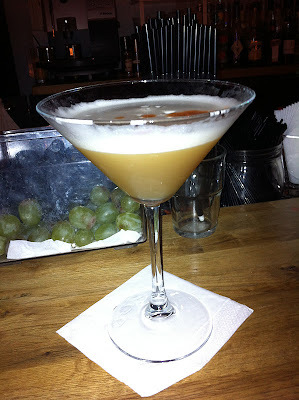 He or she will ask you questions about what cocktails you like, your flavour preferences, if you like your cocktails sweet or sour and so on, and from this proceed to make you a personalised cocktail. Being sat at the bar meant we got the perfect view of the whole process of our own and everybody's drinks being mixed. To work here you really need an amazing knowledge of the art of cocktail making, the different flavours and what mixes well together and so on - a real skill. These were our first two drinks of the night, my husband had a rum sour drink with passion fruit. He described it as being strong and slightly bitter with an orange after taste as the mixologist had flamed the drink with orange zest whilst preparing it. 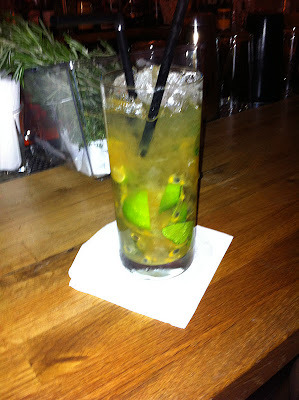 My first drink was mojito in style mixed with passion fruit, refreshing and not too strong. I later had a sake based drink which was really good, and my husband had one with gin. It certainly is not the cheapest night out, but for a couple of drinks as part of an evening or on a special occasion it's a lot of fun and well worth it.